What counts as a hobby? Whether you're filling out a dating profile or a job application, the question of what your hobbies are is bound to pop up. But the question has always stumped us. There are the classic hobbies that were popular with our grandparent's generation like stamp collecting and figurine collecting. . . mostly collecting stuff. And how is that a hobby? What are you doing with your time? Organizing? How is that fun? And sure, some hobbies are more active these days. There's running and biking and paddleboarding. But we want to know whether we can answer the hobby question with a sinister flare when the time comes. Is it acceptable to let the people browsing your profile know that you enjoy plotting against the young princess who lives in your castle? Would people think it's weird that you boast of knowing how to make the prettiest poison apples in town? We think it's cool, after all, no one ever said that your hobbies had to be wholesome! 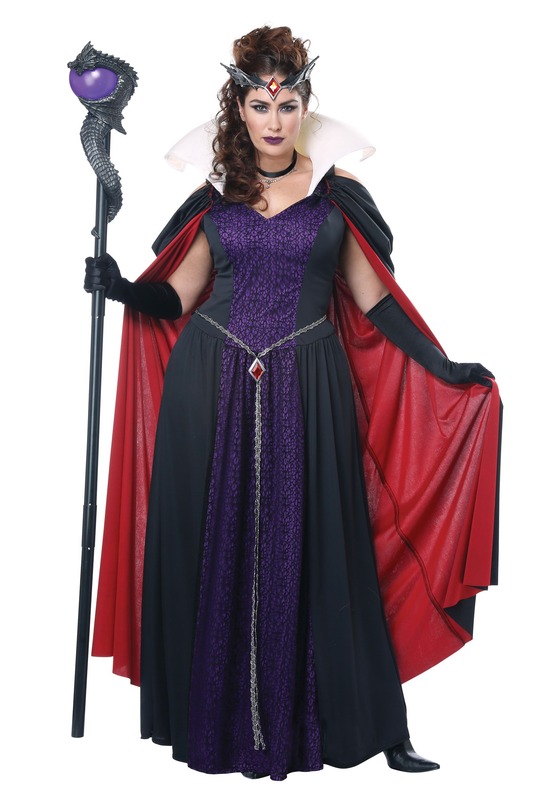 Wear your villainous leanings on your sleeve with this evil storybook queen costume. This dress features a black and purple panel down the center with a silver belt that drapes down the middle, accentuating your queenly vibe. The collar is dramatic with an upturned twist while the black and red cape drapes down in an off-shoulder cut. Find yourself a domineering staff and your look will be one for the books! There's no wandering around, singing with little birds for queens like you. You're not made of wishes and lace, you've got a kingdom to rule, you got to get real. This Halloween, allow yourself to revel in your villainous ways. It's about time we paid a little more respect to the evil queens in those stories. We'd rather have the queen ruling on a throne rather than talking to rabbits in the palace garden. So, straighten that crown on your head and claim your place on the throne! we won't tell anyone about your poisoning talents if you don't want us to.